Buried Treasures is a column dedicated to things we feel have gone underappreciated, often both critically and commercially. We encourage you to seek these treasures out and hope you enjoy them as much as we do. We're very pleased to have another guest blog from Jamie of Audio Antihero, following his piece on Nosferatu D2 last May. Now given that I run Audio Antihero Records: Specialists in Commercial Suicide, you’d think that I would have my hands full worrying about my own Jack Hayter (Hefner/Dollboy/Spongefinger) solo release....but I can’t resist the temptation to be an old blowhard and so here I am, spreading the good word about his solo debut, 2002’s 'Practical Wireless'. 'Practical Wireless' is a record that should probably have been guaranteed a respectable cult status on principle alone. Released on the intimidatingly hip Absolutely Kosher Records (Xiu Xiu, Mountain Goats, Life Without Buildings), recorded back to back in a kitchen with Hefner’s final LP 'Dead Media', produced by Darren Hayman and featuring Hefner alumni on various instruments (it’s like the folk equivalent of Eazy E’s 'We Want Eazy') - in a post-Hefner world, this should have been just what the people wanted?! Whether it was too soon (Hefner’s "split" was rather blurry and unspoken), moany Hefner fans weren’t willing tolerate any further genre tail offs following the "difficult techno" on 'Dead Media' or people had somewhere else to be – the album was not much of a success. In fact, 'No Spondulicks' refrain of "I’ve got no cash...I’ve got no moolah....and I’ve got no spoldulicks!" may have been prophetic of the financial return this LP would see. The press too were mixed - people loved it, people hated it and many sat in between. It’s understandable really; the record is slow and sparse with its style rooted in a Topic Records sounding folk but littered with strange analogue synths, bleeping electronics, curious samples of a chap muttering "Merry Christmas! ", a nicked drum loop that shall remain nameless and even an arguably sacrilegious cover of Only Ones classic 'Another Girl Another Planet' (I like it). While I wouldn’t say that any of the above are weaknesses in particular, it’s certainly not a perfect record nor even necessarily a one that anyone would know that they want to own from description or even on a first listen but given time it’s an album that proves its worth and very much holds its own against the exquisite post-Hefner folk stylings of Ant and Darren Hayman. 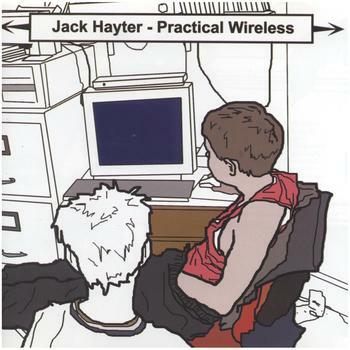 I know all this because I got into, Jack Hayter’s work completely retrospectively. I was around 13 when Hefner were at their commercial peak so I was pumping the rap-metal and would have had no time for an acoustic record from an indie-rocker. My interest in Jack came from the incessant nagging of Audio Antihero artist, Benjamin Shaw, who forcibly brought an earlier version of Jack’s 'I Stole The Cutty Sark' into my life. This led to Audio Antihero releasing his 'Sucky Tart' EP back in January, my growing love of Hefner, my adoration of Spongefinger and my increasing appreciation for the gorgeous ambient freak folkers Dollboy. It’s also seen me, listen after listen, rocking the hell out of 'Practical Wireless'. Pumping my fist at 'Misfortune’s Big Statue', giggling like a school girl at filthy French in 'Au Lion D’Or', floating with the ghostly 'A Boxer’s Dead Wife', getting honky to the vindictive tonky of 'Walking', humbly reflecting (never about good things) alongside 'Narrow Skies' and being simply mesmerised by the utterly perfect 'Seduction Of Nancy'. Like I say, it isn’t a flawless record....but I’ve got plenty of those. Sometimes it’s nice to spend 50 minutes with a record that’s a song too long, a chord change short and one crackle and thud away from being amateur – in everything it does wrong it’s just right. 'Practical Wireless' is a Buried Treasure in the truest sense, a little shabby, neglected and lacking in polish but there’s still a story and plenty of value – it’s just waiting to be dug up. My only fear is that if Absolutely Kosher (a REAL label) can’t make Jack a star, what chance have I?! 'Practical Wireless' is available from amazon.co.uk or Absolutely Kosher. The 'Sucky Tart' EP can be streamed and purchased at Audio Antihero.